Uefa has opened disciplinary action against the Football Association of Ireland for the protest that took place during Tuesday's Euro 2020 qualifier. 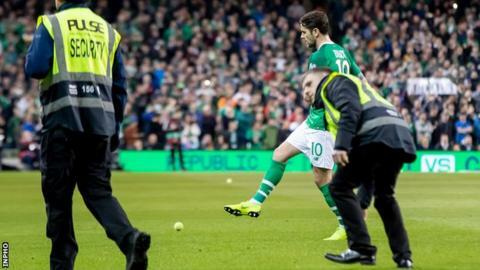 The Republic of Ireland's 1-0 win over Georgia was delayed by four minutes when fans threw tennis balls on to the pitch at the Aviva Stadium. Dozens of balls were thrown from the stands in protest at ex-chief executive John Delaney remaining at the FAI. The charges will be dealt with by Uefa on Thursday, 16 May. The FAI has been charged under Article 16 (2) of the Uefa disciplinary regulations after the planned protest delayed the match during the first half. The demonstration in the 33rd minute was in response to the FAI's decision to offer Delaney a newly-created Executive Vice President role less than a week after it emerged the Association had received a 100,000 euro loan from their long-serving chief executive in April 2017. Delaney has said that the "bridging loan" was repaid in full two months after it was received. The Irish Government has written to the FAI to demand further information about the loan and Delaney is expected to be part of an FAI delegation that will attend a government committee hearing on 10 April, to answer questions on the Association's financial dealings.